Located in West Africa, Banjul, formerly known as Bathurst pre-1973, is the coastal capital city of The Gambia; a hidden gem perfect for holidaymakers looking to explore authentic culture. Combining cheap flight tickets to Banjul with a whole host of affordable, top quality beachside hotels to choose from, there's no reason this destination shouldn't be next on your list of places to visit. Sitting pretty on St Mary's Island where the Gambia River meets the Atlantic Ocean, you can expect to encounter plenty of secluded and sandy beaches to enjoy in the year-round hot climate. Temperatures average above the mid-20s every month of the year, peaking in June at a warm 27°C, with the dry season spanning from November to June and the remaining months being the wet season. 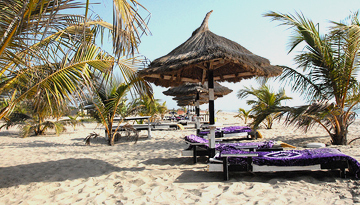 Beaches and a hot climate are not the only things Banjul has to offer. Considering it is the smallest capital in Africa, it is home to many attractions that symbolise their rich history. The Gambian National Museum is worth a visit when you are in the capital city to get a picture of Banjul's place in the history of the country and its attempts to gain independence, it's time as a trading post under British rule and the circumstances of the military coup defeat of 1994.. As the country's economic centre with peanut processing at the heart of its principal industries, another museum worth paying a visit to is the African Heritage Museum. Immerse yourself in true African customs and visit the Albert Market, where you can pick up traditional West African clothing and textiles, carvings and paintings amongst other works of art. To be at one with nature, visit the nature reserve or the River Gambia National Park, where you can take a boat tour to experience the beautiful scenery and learn more about the wildlife including the birds and chimps. Take a break in a restaurant and try some traditional Gambian food, as the cuisine notable for its stews made with meat and fish. Whilst the transport running throughout Banjul may not meet most people's modern expectations, you can travel from the airport and to nearby Dakar and Bissau by car and Barra by ferry, allowing you to embrace even more of Gambia on longer stays. For an escape from your everyday routine, The Gambia offers the perfect chance to experience a different culture you'll take an instant liking to, all you have to do next is compare cheap flights to Banjul with Compare and Fly! Lufthansa Airlines offers a Special flight tickets to Banjul from London at just £432 roundtrip. 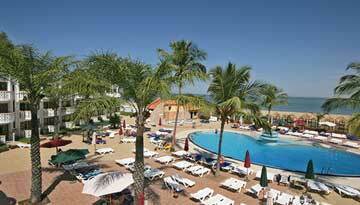 Stay at the 4 star accommodation Laico Atlantic Banjul from £46 per night in Banjul. 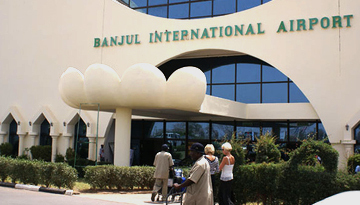 Flight from Manchester - Banjul & Stay for 7 nights with 3 star accommodation. All Inclusive.